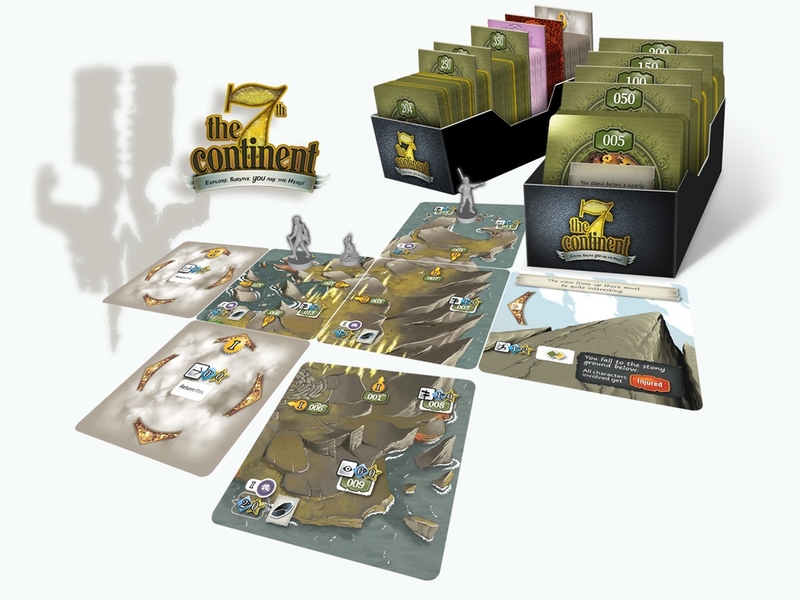 Serious Poulp has launched their Kickstarter campaign for their new adventure survival board game, The 7th Continent. The game is sort of a board game version of "choose your own adventure" books, where you and your other players work cooperatively in order to lift horrible curses that were placed upon you when you first visited this new land (I doubt the travel agent mentioned that when booking the original trip). As you play, you slowly build the board with terrain and event cards, so every time you play, you get a different game. Craft items, hunt and fish in order to have food to eat, work with an environment that's not exactly the most welcoming, and level up your character in order to gain new abilities. This play-at-your-own-pace game lets you really explore the world, but remember, you are cursed. So, with a game that has 1000+ hours of gameplay, they've also integrated a "save mechanic" that's sort of like video games, so you can come back quickly and easily to play some more. The campaign is rather popular, it's working on being 6x funded. The campaign is set to run for another 27 days.